It's been a while since I read a book non-stop, but I found myself home-alone, recovering from a stomach bug, and my youngest brother's copy of the Silmarillion lying ignored on the desk. Perfect conditions for a read-a-thon, which lasted for 14 hours! And happily took little effort, as J.R.R. Tolkien is one of my favourite authors. For the uninitiated,the events of Silmarillion come before the Hobbit, before the Lord of the Rings, much before most of the characters of either book existed. And if you are so uninitiated that you haven't heard of any of them, well, then dont bother reading any further. For you are not one who can comprehend the world of fantasy, there where my mind often flees for solace and silence,to dabble in awe and wonder, and to leave the suffocating bonds of reality. Fantasy is my favourite genre by far, and this is my first fantasy book review, so do forgive me if I get carried away. So back to the book. Tolkien is in a wonderful position at the start, for he has carte blanche. Imagine writing a tale that takes place before the Big Bang occurred, before time or space as we know it existed. Such was the empty canvas upon which Tolkien painted his universe. So he describes a God, Iluvatar, and His vassals whose song creates out of the void, Midlle-earth as we know it. Some of these vassals, christened the Valar, enter Middle-earth to govern it and make it fit for the children of God, elves and men. Then one of the Valar decides that he wants to possess all Middle-earth for himself. Enter Melkor, aka Morgoth, the antagonist for the most part, and the book describes deeds that were done by the Elves in their war against him. For Melkor stole from the elves the Silmari, three perfect Jewels crafted by the elf Feanor, in whom is preserved the Light of the Two Trees created by the Valar. Feanor and his sons swear an oath to wage war on whoever possesses a Silmaril, for in them too the darkness of possession is awakened. Thus Feanor and his people turn their back on the Valar and embrace a dark path of war, destined to consume their kin, and come to Middle-earth, where Melkor has entrenched himself. The book goes on to tell many tales of valour, heroism, sacrifice and love, and just as many of deceit, betrayal and malice. For me, most moving of all were the tales of the fall of Fingolfin and the story of Beren and Luthien. Fingolfin, half brother of Feanor, faced with certain defeat and possibly the obliteration of his race, challenges the Lord of darkness Morgoth to single combat. The venture, although hopeless (for Morgoth is one of the Valar, and Fingolfin, no matter how great, is an elf), showcases the bold and limitless self belief that the elves had in themselves, and armed mostly with this belief, and a love for the elves of whom he was King, Fingolfin fought, gave Morgoth seven wounds, cleaved off his leg, but fell in the end. The tale of Beren, a man, and Luthien the elf maiden almost made me cry at the end, hopeless romantic that I am. For theirs is THE epic amid all the many love stories in the book, and theirs was the first union between man and elf. Beren, in order to win the right to marry Luthien, does as her father asks and seeks to wrest a Silmaril from the clutches of Morgoth. In this he is assisted by Luthien herself, for she cannot bear to be apart from him. The two achieve the impossible, not once, but twice, for not only do they manage to escape Morgoth's fortress with a Silmaril, but Beren also comes back from the land of the dead, as the sorrow and love of Luthien moves even the hardest hearts of the Valar. One of the recurring concepts in the book I really enjoyed reading was The Gift of Men, that is death and mortality, which is also spoken of as the Doom of Men. This Gift the God Iluvatar gave only the race of men; the elves he made immortal. Death, which we humans fear so often, becomes an objecct of wonder for the Elves, for it signified a freedom from the cycles of the world, which they had not been granted. For them it truly is a gift, but few mortals would look at it that way. How many of us can really think of death as a gift? Can we keep in mind that our mortality should drive us to value every second, and make something beautiful of it. And isn't death, to the organised mind "the next great adventure"(Yes, I'm quoting Dumbledore, in a Tolkien book review)? If you, like me believe that the soul is eternal, its not that hard to see. Funnily though I don't think Tolkien believes in rebirth et al. For he does speak of a place where the souls of elves go after death, but never what happens to the souls of men, and never that any soul returns to be born again. And so if you are a fantasy fan, and haven't read the Lord of the Rings yet, I strongly suggest you read the Silmarillion first. The stories are just as rich and the narrative just as enchanting (though the chapter on the children of Hurin seemed to drag a bit). It will fill some of the gaps that the reading of the Lord of the Riongs presents, for in that book, the events of the Silmarillion are spoken of in the way we would speak about the Mahabharata, as myth and legend alone. 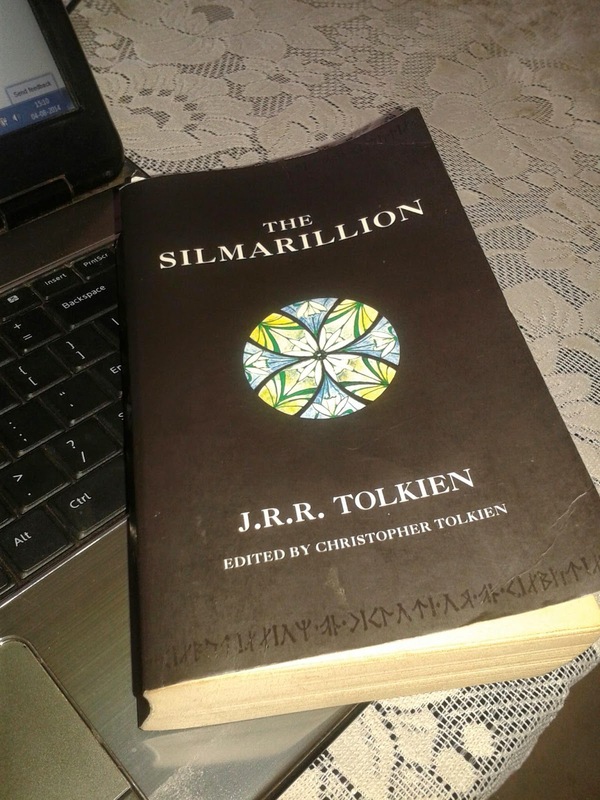 If, like me, you have read the Lord of the Rings already, still I suggest that you go back and read the Silmarillion. I can promise you, at the very least, a lot of "Ah thats what he was talking about" moments.